It’s a Yahoo! Directory page that was ranking in the Google search results on a Google Android mobile device. user behavior Google claimed that Bing was using “their data” when tracking end user behavior. Google hosts the Yahoo! 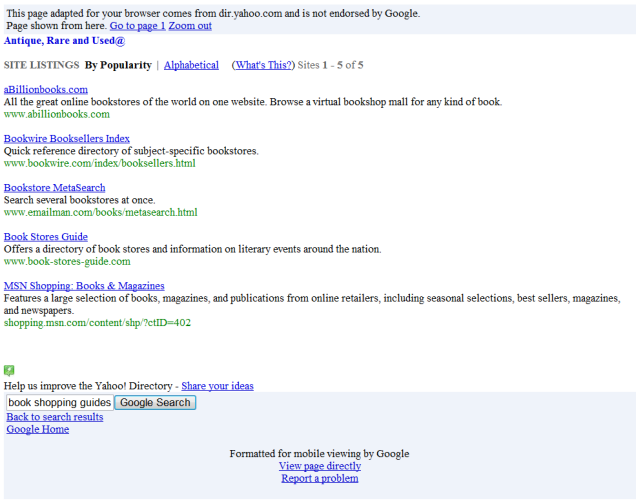 Directory page, allowing themselves to fully track user behavior, while robbing Yahoo! of the opportunity to even see their own data with how users interact with their own listings. 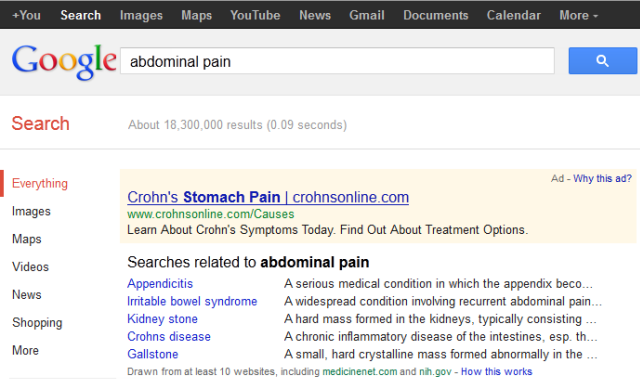 The ads remain up top & the organic resultss get pushed down. It isn’t scraping if they get 10 or 20 competitors to do it & then use the aggregate data to launch a competing service … talk to the bankrupt Yellow Pages companies & ask them how Google has helped to build their businesses. Update: looks like this has been around for a while…though when I spoke to numerous friends nobody had ever seen it before. The only reason I came across it was seeing a referrer through a new page type from Google & not knowing what the heck it was. Clearly this search option doesn’t get much traffic because Google even removes their own ads from their own search results. I am glad to know this isn’t something that is widespread, though still surprised it exists at all given that it effectively removes monetization from the publisher & takes the content wholesale and re-publishes it across domain names.